I am guilty of always picking up recipes from the grocery store and never using them. They always have those little free recipe ideas and the pictures always look amazing! This recipe came from one of those cards. It was for a Keebler Ready Crust and they list many recipes here. Depending on my time sometimes I use a premade crust, sometimes I make it. Whisk 1 Tablespoon milk and softened cream cheese. Gently stir in HALF cool whip. Fold in candy. Set aside. In a separate bowl, whisk 1 cup cold milk and pudding for 1 minute. Gently stir in remaining cool whip. Put half of this mixture in the bottom on the pie crust. 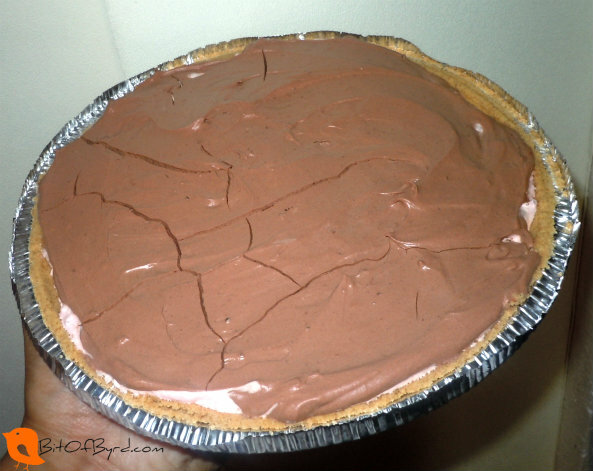 Spread the cream cheese mixture over the pudding in the crust. Top with remaining pudding mixture. Chill in fridge for 4 hours. Keep chilled to keep from going mushing. I have made this a few different times with different candy bars and it comes out good no matter what. I suggest using a hand held mixer for the cream cheese and pudding steps before adding cool whip. I didn't the first time and it seemed lumpy. Still got eaten right up. What is your favorite candy bar that you would use? It would be great with candy pieces or Reese's cups!